Thank you for this lovely review. It is very timely, since I just bought a bottle of Terracotta this week unsniffed. The first night I tried it I was not sure, but I had been wearing Douce Amere earlier. I wore it on its own yesterday and it is understated but very nice. It was interesting that the review is in the middle of all those fun Demeters you have been reviewing. I'm still doing my every-Friday blog posting in addition to the whole month of Demeters, which explains the Terracotta review. I bought it unsniffed, too, which is not usually a good idea, but I figured, carnations, how can I go wrong? Your review made me buy unsniffed -something I NEVER do! I adore carnation in a scent, and I do remember sniffing Terracotta many years ago, thinking it was very attractive, but dismissing it as just an adjunct to the makeup line and not a 'real' fragrance. I'm kicking myself now - having received Terracotta, I'm enraptured. The soft, salty vanilla/carnation drydown is just heavenly. 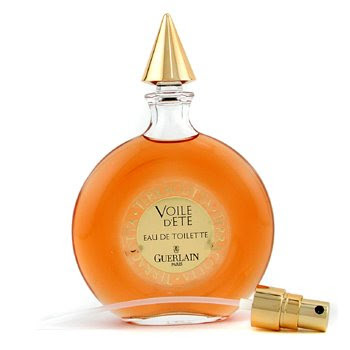 In fact, it's kind of a lightweight summer version of Guerlain's Metalys, which I find a bit too much in warm weather. Thanks for pointing the way to this beauty! I'm really glad you like it! It's true that buying things unsmelled is not usually a good idea, but I figure if enough people give it a thumbs-up and it sounds like something I like, then it's probably worth a shot. That's price-dependent, though: if it had been $75, I would never have tried it without smelling it first, but at that price, it was obviously worth a shot. I've never smelled Metalys, but some reviewers say that Terracotta is like a simplified version of Guerlain's own Quand Vient L'Ete. Maybe they're just re-doing the same thing over and over again. All I know is, with Terracotta, they got it right.